Intro ‘Carnificina Seclesta‘ may as well carry Dante Alighieri’s subtext: “Abandon all hope, ye who enter here“, for what follows is one of the most “satanic” death metal albums ever recorded. If death metal be a musical inversion and an ideological rejection of the spiritually humiliating doctrine of “man as creature of immanent sin needing redemption”, then Cross The Styx remains one of the most potent enfilades fired by the genre at orthodox, organized religion. 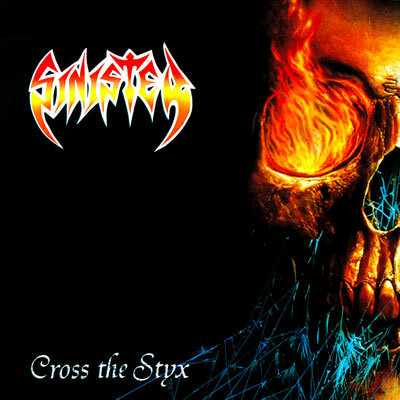 A masterclass in death metal rhythm guitar playing, Cross The Styx is inspired by the Deicide debut, but I will play devil’s advocate, and say that this album was released a couple of months before Legion, the Deicide album it bears closest resemblance to. Make of that what you will. The Deicide connection is most apparent in the use of short phrases with intricate syncopation and a constant, staggered, quasi-percussive string attack (think “Infernal Majesty, take this dead offering, feeding the demon seed, evil bestowed on me“). Where Sinister part ways with Deicide is in more pronounced, lateral melodic movement, frequently couched in fast, speed metal mannerisms. Dense with riffs like few other death metal albums, it could be said that each of these riffs are mini-compositions in their own right, such is their detail and movement towards a very real crescendo. At the head of just such a crescendo is frequently found a sort of “tail” leading into the next riff; this tail may be something as simple as a furiously repeating slide-reverse slide maneuver, but the effect is one of cumulative motion. There is no stasis to be found on Cross The Styx, and not because of a lack of dynamics either; yes, this is an album of fast, hyper-aggressive death metal throughout, but it also boasts of immense variation of structure at the lower levels, bringing into play a degree of musicality that its extreme aesthetic belies. Blod Draum is the music of painted Caledonian warriors charging down the Scottish highlands in full battle lust to face the charge of Roman legions into the British isles. Savage and exotic by equal turns, Blod Draum makes the fan of this music wonder wistfully of the time that must have been to give birth to such creatively adventurous and emotionally stirring high art. Fortunately, music’s specific nature, so different from all other forms of art, allows us to remain firmly entrenched in that past, to learn and relearn the truths that made it what it was. Molested capture the zephyr-like essence of long-form, consonant melodies practiced by the likes of Dissection and Sacramentum in a heavier and more insistent death metal mold. 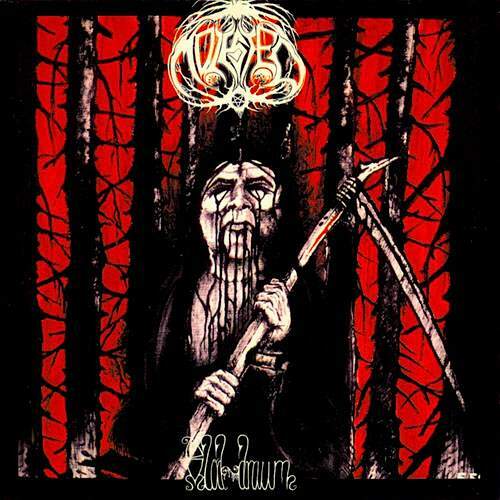 The aggressive component to Molested‘s songwriting is mostly sublimated as a bridge to that expansive, melodic nature; the only occasion when that twisting dissonance is heard in full stride is on album closer ‘Forlorn As A Mist Of Grief‘, which offers a tantalizing vision of experimentation in harmonically diminished tones. Use of musical implements like bagpipes, violins, and didgeridoos, is made at opportune moments, as segues and interludes, to give this album a decidedly rustic, unorthodox, and thematically united air, a sum effect which only the most hard-nosed of critics would call gratuitous. The delicacy that the reader may initially suspect of such a description is actually a high idealism; whatever one’s opinion of idealism might be, Molested prove that it can be employed in the achievement of nobler deeds, in the abstract or in the flesh. I prefer Cross The Styx because of its relentlessly violent nature, as well as its total mastery of the death metal form, at micro, macro, and over-arching levels. While Blod Draum‘s highs are true summits for the paradigm within which it operates, Molested‘s is a fundamentally melodic take on an abrasive stye; that is no reason to discount their prowess, but the fact that that abrasive style fails to be fully realized in any manner other than an avalanche of drums, counts against them in this close match-up. The question that leads to be asked of us all is, what is the true nature of death metal? This entry was posted in Death Metal, Death Metal Battle Royale and tagged blod draum, cross the styx, molested, Netherlands, Norway, snister. Bookmark the permalink.